Don’t like your surname after divorce? Change it using LegalDesk.com in a Quick, Hassle-free way. A divorce is a dissolution in marriage that divides the marital union between a couple. A divorce can be an unsettling affair between a couple. Some women prefer to change their surnames while others prefer not to, to avoid complications in their children’s names. in legal documents. 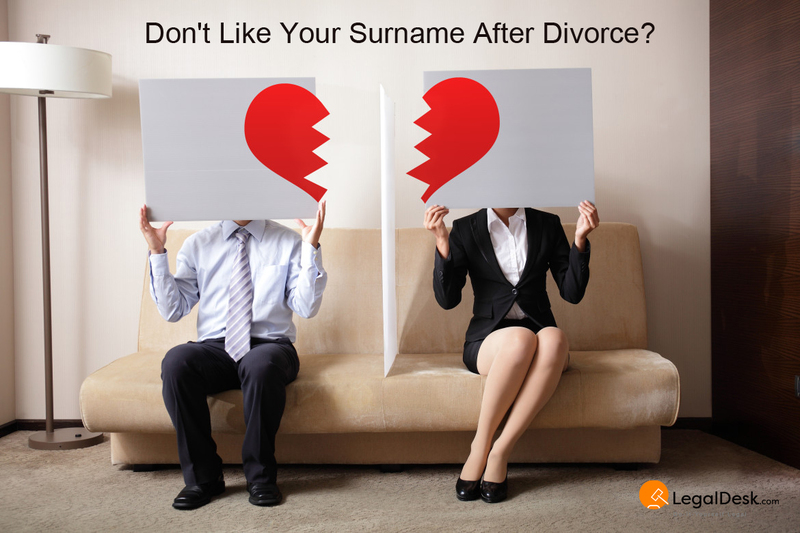 Changing your name after divorce can mean a new start to your life. When you are changing your name, you can opt to keep your maiden name or change your whole name. As long as you possess the right legal documents and understand the name change process in India, the procedure is simple. Name Change can be done in two ways namely by Court Decree and Gazette Publication. The court will then invite objections from the general public to file their objections, if any, in respect of the said name change. If anyone has any objection he/she shall file for objections in the said court. If no objection comes before the court within the specified time period, then you will have to provide substantial evidence to the court in order to support your claim. You will have to submit documentary evidence to prove that your name is ‘A’ and in support of the same, you should produce your birth certificate and other documents wherein your present name is written. In your statement in evidence you must state that your name mentioned in the said documents should be read as……..(new name) in place of the name mentioned. Produce all said original documents before the court and hold photo copies of the same as proof. Your second witness in evidence should be either your father/ in his absence your mother. They should give their evidence to the effect that you are their son. Their statements should support your tendered evidence. However, this is not mandatory. All of the above steps involve a lot of time and money. In this fast developing world, the question as to how will one make time to go through this hefty process, and how long will such procedures take to get a name change. However, there is a solution to such a problem. You can opt for a name change through Gazette publication and bid good bye to a hard time consuming way of getting a name change done. The Gazette publication method is faster, easy and legally binding. By just following 3 simple steps, you can get a name change done in a quick hassle-free manner. LegalDesk serves your legal requirements in a faster and easy manner by minimising the process of traditionally changing your name. Our 3 easy step formula of changing your maiden name to whatever you prefer will ensure faster and hassle-free way getting your name changed. The next step is to publish a notification or advertisement of name change in a local newspaper (one English newspaper and one regional newspaper published in the official language of the State). The final step ends with the Gazette publication. Gazette publication for name change is mandated for Government employees. However, it is recommended for everyone since it serves as a substantial proof of claim. Can You Change Your Child’s Name After Divorce? Yes, you can change your child’s name after attaining a divorce. You can change your child’s surname without your husband’s consent. But, this may not be possible if your husband gets a restraining order for such a change. Once your child’s name is changed, make sure you also change it on other important documents like, Aadhaar, Pan Card, Voter ID, Passport, Driving Licence, Bank Documents, Insurance, Loans, etc,. ID Proof of Individual: Pan card or Passport or Driving Licence or Aadhar Card or Voters ID. Important Note: It is not mandatory to update your new name on your educational documents. Need To Change Your Name? Earlier, getting a name change done in India involved a lot of paperwork and was time consuming. Currently, LegalDesk.com has a new legal method of doing it in a quick, tension-free way. We offer a Do-It-Yourself option that enables you to create any legal document all by yourself in just a few clicks. Come join us in our quest to digitise India. Our Support team will help you with the process involved in name change that requires an affidavit, placing newspaper announcements and providing other documents necessary for Gazette notification. Opt for LegalDesk and we will provide you with pre-drafted legal templates. We also offer a doorstep delivery service. Avail the best legal documents today! There are 0 comments on "Things To Know About Name Change After Divorce".